Having integrated sustainability and risk management along the entire investment process, Bank J. Safra Sarasin can provide clients with an attribution analysis across the full set of risk factors as well as the factor sustainability. Reporting is seen as an integral step in the investment process. In addition, Bank J. Safra Sarasin offers a detailed ESG Analysis for a client’s entire portfolio. 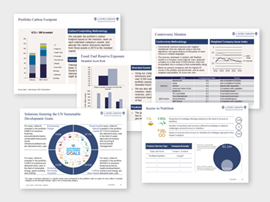 The analysis provides more concrete ESG insights on the aggregate portfolio’s and holdings’ profiles from a sustainability point of view. This step enables clients to evaluate their sustainability risk exposure and impact and thus equips them to act and further improve their investment profile and contribution to sustainable development. Bank J. Safra Sarasin supports the trend towards increased disclosure on corporate ESG factors and the strength of voluntary investor initiatives, stock exchange requirements and stricter legal regulations throughout the world.